Sights to See. 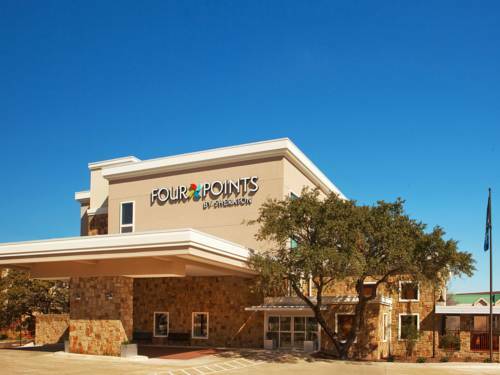 Enjoy our citys many personalities during your stay at the Four Points by Sheraton San Antonio Airport. Were minutes away from all the great cultural and entertaining attractions, such as the River Walk, the Alamo, SeaWorld, and Six Flags. And we offer free transportation to and from San Antonio International Airport (SAT). Everything You Need. Take a break from your day with fantastic local food and drinks at our restaurant and bar, which also have free wireless High Speed Internet Access. Stay in shape at our fitness center or outdoor pool. And we have a great space for meetings and events, including a large function room and a beautiful outdoor terrace. A Place to Hang Your Hat. At the end of a long day of business or leisure, you want a place to get a good nights sleep. And thats what youll get in any of our 120 beautifully-appointed rooms, featuring the Four Points by Sheraton Four Comfort Bed , plus plenty of free extras like bottled water. We invite you to enjoy a city where history and sophistication meet. With free transportation to and from San Antonio International Airport (SAT), our hotel has a great location for you to explore this romantic and adventurous area. San Antonio celebrates its rich culture with recreation, adventure, art, and food. You can take a stroll or boat ride along the famed River Walk, visit the Alamo, tour the eclectic King William District, or get a taste of heritage at El Mercado. At almost any time of the year, you can attend a charreada (Mexican rodeo), dine European-style at a riverside bistro, attend an opera or a Broadway show, and top off the evening with a live blues, jazz, or country performance all in one day. For family fun, SeaWorld San Antonio is just minutes from the hotel. Be entertained and educated by Shamu and all the other marine life. There are also thrill rides and water slides in this massive theme park. Also just a short drive away is Six Flags Fiesta Texas, with more than 200 acres of activities. Enjoy dozens of thrilling rides for all ages, exceptional live shows, and a water park. Other great family destinations include the San Antonio Zoo and Aquarium, the Botanical Garden, and the Witte Museum. Head to the Quarry Golf Course for an exhilarating 18 holes. And theres plenty of high-end shopping for everyone at the North Star Mall. The University of the Incarnate Word and Trinity University are close by, as is Northeast Baptist Hospital. Our hotel is near many corporate offices, such as Clear Channel, Whataburger, FlightSafety, General Dynamics, Siemens, and FedEx. Fort Sam Houston and Brooke Army Medical Center are also minutes away.